With a Mexican heart and a Caribbean soul, Cozumel is a paradise where tradition, flavor and joy come together. Famous all over the world for its coral reefs, there are plenty of water sports such as diving, deep-sea fishing, snorkeling, kayaking and more. With its beautiful beaches and exotic locale, Cozumel is an ideal destination where honeymooners can enjoy colorful and breathtaking sunsets, moonlit walks on secluded beaches, swim through crystal clear blue waters and romantic candlelight dinners. The swim is an in-water start in the sea swim and start and finishes at CHANKANAAB park beach. Water temperature for the month of September in Cozumel is likely to be around 26°C, therefore wetsuits will not be permitted on the one lap rectangular shaped course. 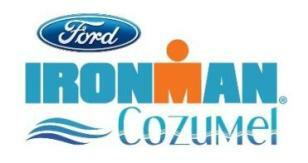 The bike course starts and finishes at the CHANKANAAB park, using the Cozumel island main road. The three loop course is flat, paved in good conditions and with a few sharp corners, and will be totally closed to vehicle traffic. We recommend that you take two water bottles during this segment of the race. The marathon course is three laps, starting at the CHANKANAAB park towards Cozumel downtown. Just as on the bike, the roads will be closed to vehicle traffic. You will find aid stations every other km with Gatorade, water, ice, PowerBar (bars and gel), Vaseline, Coke and medical assistance.